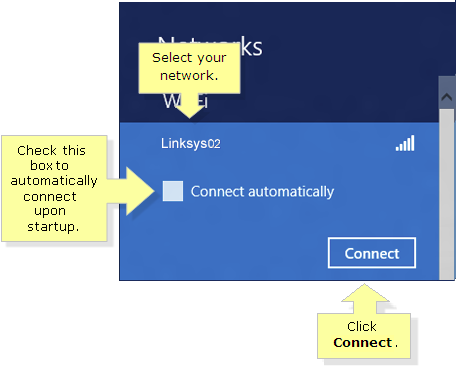 Connecting your wireless Windows® 8, 8.1 and 10 computers to the network can be done in a few steps. But before connecting them to a wireless network, check the following items first. 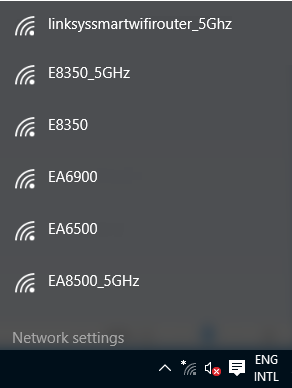 Don’t have the wireless settings? Click here to retrieve them. Ensure that your laptop or computer has wireless capability. Check the wireless switch and make sure it is turned ON. If you don’t know how to turn it ON, contact your laptop or computer’s manufacturer for assistance in enabling the wireless capability. Ensure that your laptop or computer is within three (3) to 10 feet from the router you are trying to wirelessly connect to. Click the Wireless icon on the system tray of your Desktop screen. The list of available wireless networks will be displayed. QUICK TIP: Press Windows key + D to reveal the Desktop. NOTE: In this example, the linksyssmartwifirouter_5Ghz network was used. QUICK TIP: If you wish to connect to the network automatically upon startup, check Connect automatically. Enter your network security key or passphrase then click Next. You will be asked if you want to enable network discovery between the devices in your network. 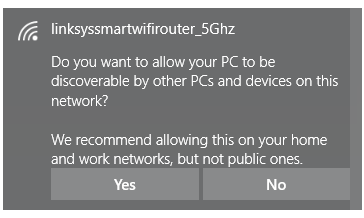 QUICK TIP: If you are setting up a home or work network, select Yes. 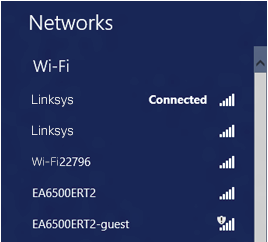 NOTE: The wireless icon on the system tray will change to , indicating it is now connected to your network with Internet access. If there is no Internet connection, the icon will be . You will be asked if you want to enable sharing between the devices in your network. 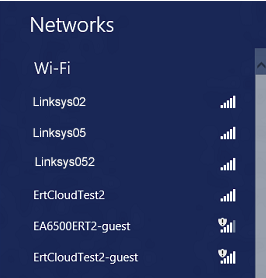 QUICK TIP: If you are setting up a home network, select Yes, turn on sharing and connect to devices. The status of the wireless connection will be displayed. The wireless icon on the system tray will change once the computer is successfully connected to the network. Upon connection to the Internet, it will display . NOTE: For video instructions on how to connect your Windows computer to the wireless network, click here. If the above steps did not work successfully, try removing the old wireless profiles first and try connecting again following the same steps. Click on the link below to know how.